Some of these type of reports simply compare the average local rent to the mortgage payment for the area’s average home and therefore can be discounted out of hand. Others include taxes and insurance which is slightly better but they are still missing a very big piece of the cost of owning and operating a home; repairs and maintenance. This includes everything from lawn care to repainting to having the furnace serviced to saving up to replace the roof and runs between 1-3% of the home’s value annually… if you are lucky. If you’ve ever managed income property and tried to stay under budget for repairs and maintenance you know how easy it is to spend a lot more. When the true cost of owning and operating a house is examined the rent vs. buy decision becomes more about lifestyle, flexibility, security and for single family houses the lack of noisy neighbors right upstairs. The myth that a home is a good investment is also shown for what it is. On average you pretty much get back what you put into a house if you’re lucky. Now during the bubble some people did tremendously well from one house to another maybe even multiple times but what about now? Or more appropriately, how about over the long term? I was recently talking with someone who mentioned that if they’d sold their home in California in 2007 instead of 2010 they would have had an extra $400,000 in equity. I reminded them that they would have just taken that and rolled it into the next house and at 5% down that could have been up to an eight million dollar bigger house! How would you like to be upside down on that right now I asked. As you can see, the value of the home barely gets above the total dollars paid in and that’s before any costs of selling are considered (approx. 10% of selling price for commissions, fees, closing costs, preparing the house for sale and marketing). For the chart above I used a $300,000 purchase price with 20% down on a 30 year fixed mortgage at 3.62% which was the average Freddie Mac backed rate posted yesterday (For current rates see the Mortgage Rates and Indicators box in the right hand column). For taxes and insurance I used the national averages of $1,180 and $860 respectively. For repairs and maintenance I went on the low side of the range at 1.5% percent of value annually. I used Case-Shiller’s 100 year house price appreciation of 3.3% which is slightly higher than FHFA’s House Price Index appreciation from 1991 to 2012 of 3.0%. So over forty years you would have put in $985,431 and gotten back $957,803 after selling it, in other words, at the end of the day it would have cost you only $27,628 to live in that house for 40 years. That’s less than 58 bucks a month, a pretty good deal for a nice place to live but as an investment 0% over 40 years is not going to get you on Bloomberg TV wowing the hosts with your investment genius while promoting your latest deal. Of course that’s 0% return after coming up with the $60,000 down payment and the out of pocket cash for payments, taxes, insurance, maintenance & repairs for those forty years, oh and qualifying for the loan too. What about the tax savings some might ask. My first answer is to quote a very wise tax attorney I worked with years ago: “Never let the tax tail wag the investment dog”. The other thing is that at least until we hit the fiscal cliff in four months the mortgage interest portion is tax deductible if it exceeds the standard deduction but the down payment, the principal and every other cost is paid with after tax dollars. Taking how much you would have to earn just to pay the down payment and principal ($300,000) for example would be $384,000 in the 28% tax bracket. Now I have nothing against owning your own home but if anyone pitches it to you as an investment make them run the numbers, the real numbers. That we can with essentially the stroke of a pen secure shelter for our loved ones, something that for thousands of years had to be wrested away from saber-toothed tigers at great peril I believe is one of mankind’s greatest achievements and it should be enjoyed as such. 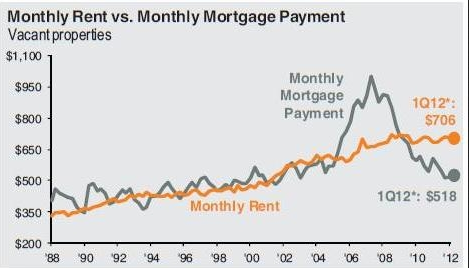 I agree…..but most investors can’t tie up their real estate monies in to an agressive mortgage payout. I personally am a big fan of the 15 year mortgage…but I think that paying a mortgage in 10 years will benefit investors the most in the long run. The key to making sure that owning your home is great investment is paying off your home loan early. You can achieve that by sending an extra amount toward the principle every month. This will lessen the amount of interested paid over the life for your mortgage, therefore making it a sound investment. 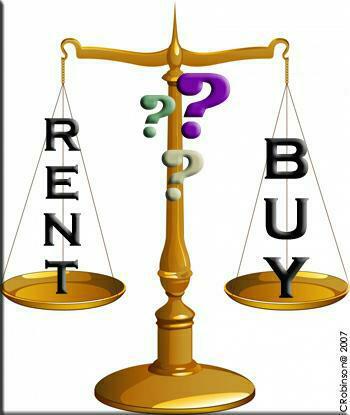 You are right however, if you do not lessen the interest, then there is not a big difference between renting over buying. Marc, how quickly are you advocating someone should pay off their mortgage? We are into the same Real Estate in India and we see this blog section in your website and we really liked your way of posting the content which is helpful for SEO. And the information you given is nice and clean. Pls post on articles and we will like to see it again. Thanks for your comment. Where is the occupancy rate for flats in your market there in India? The problem with most rent vs. buy calculations is that they vastly understate maintenance, repairs and replacement reserves. Even with Zillow’s ‘improved’ version they admit: “Despite the improvement, our price-to-rent ratio is still not very meaningful to a potential buyer who is considering buying a home versus renting, because it does not include all the costs incurred when purchasing and owning a home”. Robert, That’s the key to any investment plan isn’t it? If someone just spends the savings it really doesn’t matter where. Where do you think your market is currently in terms of the cycle? Previous Previous post: Zombie homeowners are 50% of the single family move up market and they can’t buy. Good for Apartment Building Investment? Next Next post: PIMCO calls bottom in housing, but likes REOs-to-Rentals over apartment building investments?